Check out this pretty dress in pastel maroon color. It’s sweet, ladylike and can be styled with all your favorite accessories and jewelry. Complete this style by adding a wide-brim hat. Check out this stunning all in black outfit idea for Spring season days. We see a double-breasted black dress with gold buttons completed with a wide-brim floppy hat. That’s a marvelous look for special events. Get inspired by this sophisticated all in black outfit idea. We see a double-breasted coatdress with gold buttons and a wide-brim hat. The overall style looks elegant and feminine. Check out this pretty cool OOTD for Summer boat trips. We see a white off-shoulder dress completed with a wide-brim straw hat and rounded sunglasses. Simple, ladylike and summery chic. Make a wow impression on the streets this season by wearing a fabulous, smart-casual festive look. 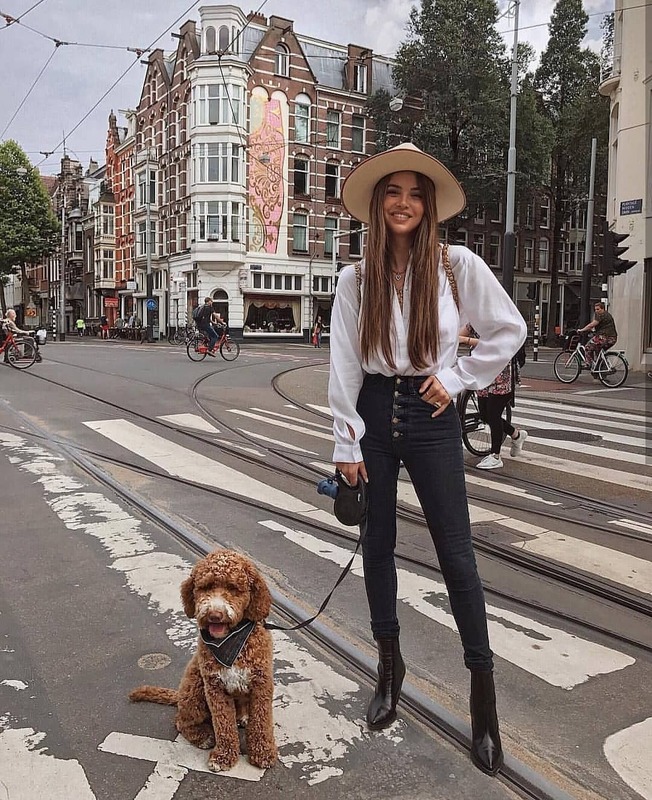 We see a white blouse tucked in black skinny jeans completed with black leather ankle boots. Add a wide-brim hat to complete this style. Have fun this Summer by wearing this fantastic cold-shoulder maxi gown in floral print. It comes with a high-slit and long sleeves. Complete this outfit with platform pastel yellow sandals, rounded sunglasses, and wide-brim straw hat. Another red outfit idea for young ladies. 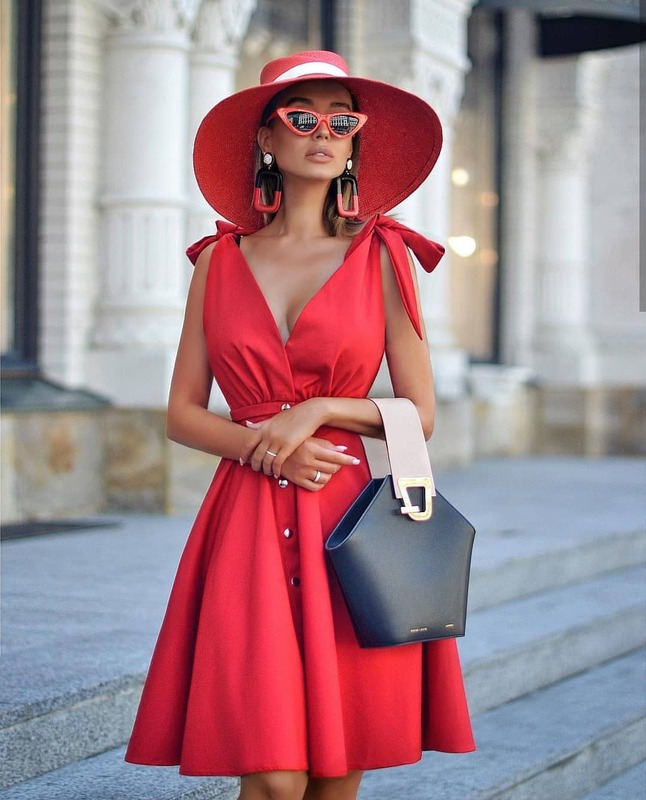 We see a red V-neck sleeveless fit-and-flare dress styled with a wide-brim straw hat in red. I fell in love with these red cat-eye sunglasses and hanging black-red geometric earrings. Go bold this Summer! We see a floral print maxi gown with a high-neck and cold shoulders. In love with its fit and the way, the young lady completed this dress by adding rounded sunglasses, wide-brim sunhat, straw handbag, and pastel yellow platform sandals. Have a look at this elegant wide pants safari beige jumpsuit with spaghetti straps. An ideal style for your Summer getaways. Complete it with a wide-brim straw hat, creative earrings, and oversized rounded sunglasses. I am 100% sure you gonna love this combo!